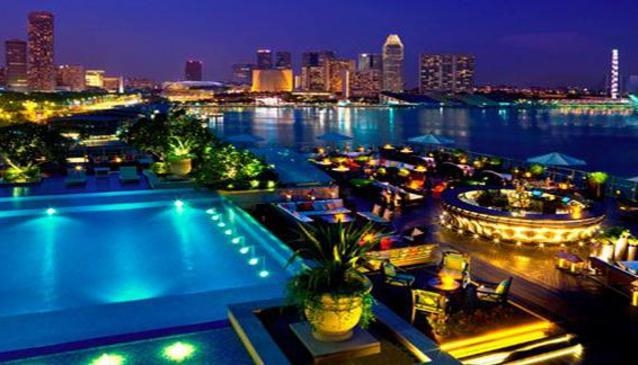 The rooftop bar of the chic Fullerton Bay Hotel Singapore was named after the nearby Clifford Pier in reference to its Chinese name ' Red Lantern Pier'. With its five-metre bar all in bronze crafted, its posh poolside atmosphere, its smooth lounge music and most of all with its stunning view of Marina Bay, Lantern offers a soothing and stylish ambience that makes you feel really special. You'll love their specialty cocktails such as Red Lantern, Merlion and Imperial Blackberry Mojito and gourmet snacks such as Petit Wagyu Beef Burgers with Truffled Fries. And for a more robust supper, opt for a salad, a steak frites with angus sirloin, a miso cod, some grilled gambas or scallops. Then all you have to do is to sit back and relax! A resident DJ performs daily from 8pm and from 9pm on Fridays and Saturdays.